2 Cecil Court, London Road, Enfield, Middx. Redwood Press Ltd. of Trowbridge, Wiltshire, England. This is the first of the larger books, with a different cover design each year. Inside front cover is "Progressive Absolute Human Speed Records". Designed by Denis Wrigley, M.S.I.A. with illustrations by Denis and Else Wrigley. Foreword says, "We have now produced nearly 5,000,000 copies". "The business world" chapter moved after "The mechanical world". "The human world" and "Human achievements" chapters swapped. The acknowledgements section recognises one more member of the production team: Mrs. Eileen Jackson. Modifications to sixty-five pages in the "stop press" section on pages 308 to 311. Inside back cover is "Progressive Human Altitude Records". Inside covers are "The Longest Pedigree Provable in English Law". Layout and illustrations by Denzil Reeves. Foreword says, "We have now produced more than 6,000,000 copies". The acknowledgements section recognises additional members of the production team: Signa. Wendy Cirillo, Miss Tessa Hegley, Tony Thomas, Esq. and Mrs Winnie Ulrich. Modifications to one hundred and ten pages in the "stop press" section on pages 304 to 309. "We received advice that John B. Salling was, in fact, some months older than we had earlier been informed by the Veterans Administration Bureau in Washington. The first 32 pages of the book are printed after some of the later sections, and we amended it in the only place we could during the course of production." Many years later, both ages were found to be incorrect. Redwood Press Limited Trowbridge, Wiltshire, England. Inside front cover is "World Superlatives in the United Kingdom & Ireland". Foreword says, "We have now produced more than 7,000,000 copies". "... we do not opine on ... the most formidable mother-in-law, only the woman with the greatest girth or the organ (or indeed the mother-in-law) generating the most decibels." Modifications to ninety-four pages in the "stop press" section on pages 304 to 309. Inside back cover is "Current Olympic Records after the XXth Games in Munich, 1972". Inside front cover is "Circus Records". Artwork by Denzil Reeves. Layout by Sally Bennett. An 8-page colour picture section inserted between the copyright and contents pages. "The human world" and "Human achievements" chapters swapped again. Foreword says, "We have now produced more than 12,500,000 copies". Further production team additions to the acknowledgements section: A. T. Albin, Esq., D. Richard Bowen, Esq., David N. Newlett, Esq. and Mrs. Hilary Leavey. Modifications to seventy-five pages in the "stop press" section on pages 339 to 341. Page 349 has, "Indexing by Gordon Robinson". Inside back cover is "World Superlatives in the United Kingdom & Ireland". Artwork by JAK. Layout by Sally Bennett. Sports editress Suzi Biggar. "Notes on acceptability of Records" added on Page 5. Foreword says, "We have now produced more than 20,000,000 copies". Modifications to fifty-three pages in the "stop press" section on pages 339 to 341. New production team acknowledgements: Miss Susan Beaty, N. Gardner, Esq. and Peter H. Hathaway, Esq. Inside back cover is "Evolution of Records in the 20th Century". A quiz book, based on this edition, was published in early 1975. We also know of a publisher's proof copy of this edition, which has a plain white soft cover and, again, has different colour cartoons throughout the book. The chapter title pages of the standard edition have the following colours: red, red, green, purple, purple, purple, black, green, green, black, blue and purple (and the table on the inside back cover is blue). For the proof copy, the chapter titles are: red, red, green, green, green, green, black, green, green, black, green and purple (but the final table is green). We are very fortunate to have a copy of the Australian edition signed by both Norris and Ross McWhirter, which was presented to Ron Besdansky to commemorate his record for travelling through all the railway stations in Sydney, Australia in 17 hours and 36 minutes. 2 Cecil Court, London Road, Enfield, Middlesex, England. Sports Editor (Suzi Biggar) credited on the title page (page 3). Artwork by Don Roberts. Layout by Flax & Kingsworth and David Roberts. Foreword says, "... in November 1974 with sales of 23,950,000 our title qualified as the world's all-time best seller among commercially sold books". Modifications to sixty-eight pages in the "stop press" section on pages 339 to 341. New production team acknowledgements: Mrs Susan Gullen, Miss Gillian Iddins, Mrs Beverley Waites and Peter Whatley, Esq. Inside back cover is "Citius Altius Fortius Evolution of 80 years of Olympic Records". Cover now shows the edition year. First book after the death of Ross McWhirter. Page 3 has "(Ross McWhirter 1955-1975)". Sports Editor (Stan Greenberg) credited on the title page (page 3). Foreword says, "In this edition we are obliged to include the gratifying entry that our twin authors qualified as the first in the history of commercial publishing to see any title achieve sales beyond the 25,000,000 mark. All who have read the work will share our grief and shock at the brutal murder of Ross McWhirter on 27 November 1975 and will share with his twin brother and co-author the loss he and Ross's own family have suffered". Artwork by Don Roberts. Layout by David Roberts (no kin). Diagrams by Eddie Botchway. Modifications to ninety-one pages in the "stop press" section on pages 338 to 340. The production team acknowledgements for this issue are: G. Howard Garrard Esq., D.S.C. (Correspondence Editor); Mrs. Amanda Clark (Editor's Secretary); Miss Moira Browne (Editor's Assistant); Mrs. Beverley Waites (Sports Editor's Assistant); Mrs. Mary Crowder and Mrs. Lucie Phillippo. Also to Mrs. Barbara Anderson, Mrs. Christine Bethlehem, Mrs. Rosemary Bevan, Miss Suzi M. Biggar, D. Richard Bowen, Esq., Signa. Wendy Cirillo, Mrs. Pamela Croome, Miss Trudy Doyle, Mlle. Béatrice Frei, Mrs. Susan Gullen, Miss Tessa Hegley, E. C. Henniker, Esq., David N. Hewlett, Esq., Mrs. Angela Hoaen, David F. Hoy, Esq., (Managing Director), Mrs. Eileen Jackson, Mrs. Hilary Leavey, Mrs. Diana Lloyd, Mrs. Jane Mayo, John Morris, Esq., G. M. Nutbrown, Esq., W. E. Nutbrown, Esq., Mrs. Margaret Orr-Deas, Peter B. Page, Esq., John Rivers, Esq., Mrs. Judith Sleath, Mrs. Anne Symonds, Andrew Thomas, Esq. (Associate Editor 1964-68), Mrs. Gillian Turner, Mrs. Winnie Ulrich, Peter Whatley, Esq., Stephen James Clarke, Esq., (1947-1976) (Management Accountant). Pages 341 and 342 have "Current Olympic Records after the XXIst Games in Montreal, 1972". Page 350 has, "Indexing by Gordon Robinson". Inside back cover is "Derivative titles for further reading". 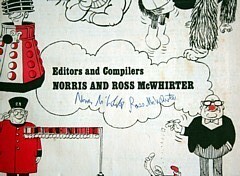 We have a copy of this edition signed by Norris McWhirter and dedicated to Ronald Proyer for his article in Annabel magazine about Rosemary McWhirter and the death of her husband. 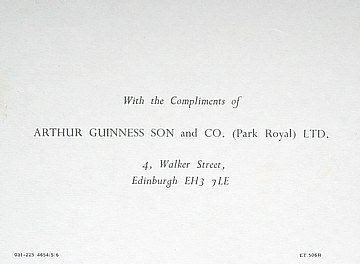 For this edition, Tom Thumb cigars (John Player Ltd.) ran a competition to win one of a 1,000 copies of the book. Four special inserts in packs of the cigars were issued, and competition entrants were required to identify two of the four world records (and then to provide "an apt an amusing reason for smoking Tom Thumb cigars"). Inside front cover is "Milestones in Absolute Human Altitude & Speed Records". Foreword says, "... global sales of this book ... have surpassed the 30,000,000 mark". Artwork by Don Roberts. Layout by David Roberts (no kin). "Animal and plant kingdoms" chapter renamed "The Living World". Pages 338 and 339 have "Commonwealth Games Records". Modifications to ninety-four pages in the "stop press" section on pages 340 to 342. The production team acknowledgements for this issue are slightly less formal: G. Howard Garrard D.S.C. (Correspondence Editor); Amanda Clark (Editor's Secretary); Moira F. Browne (Editor's Assistant); Beverley Waites (Sports Editor's Assistant); Mary Crowder, Lucie Phillippo, Peter J. Matthews and Bernadette Bidwell. Also to Barbara Anderson, Anne Belsham, Sally V. Bennett, Christine Bethlehem, Rosemary Bevan, Suzi M. Ross-Browne, D. Richard Bowen, Signa. Wendy Cirillo, Pamela Croome, Trudy Doyle, Mlle. Béatrice Frei, Jacqueline Gould, Susan Gullen, Tessa Hegley, E. C. Henniker, David N. Hewlett, Angela Hoaen, David F. Hoy, (Managing Director), Paul Hurren, Eileen Jackson, Hilary Leavey, Diana Lloyd, Jane Mayo, G. M. Nutbrown, W. E. Nutbrown, Margaret Orr-Deas, Peter B. Page, (1954-57), John Rivers, Judith Sleath, Anne Symonds, Andrew Thomas, (Associate Editor 1964-68), Gillian Turner, Winnie Ulrich, Peter Whatley, Stephen James Clarke, (1947-1976) (Management Accountant). Page 350 has, "Indexing by Anna Pavord". Inside back cover is "Guinness books for further reading". Inside front cover is "How the records have changed over 25 editions". The production team acknowledgements section has a couple of changes: Moira F. Browne is now Moira F. Stowe and Paul Hurren is removed. There is one addition: "the late A. Ross McWhirter (Co-editor 1954-1975)". Sports Editor (Stan Greenberg) credited on the title page (page 5). Foreword says, "... global sales of this book ... have surpassed the 35,000,000 mark". Artwork by Don Roberts. Design and Layout by David Roberts (no kin). Cover Artwork by Robert Heesom. Modifications to eighty-three pages in the "stop press" section on pages 340 to 342. Inside front cover is "Olympic Records prior to the XXII games in Moscow 1980". 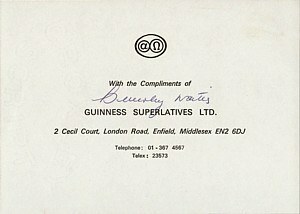 Page 4 has a list of current and planned Guinness Museums. In the production team, Colin C. Smith replaces G. Howard Garrard D.S.C. as Correspondence Editor. Foreword says, "... global sales of this book ... have surpassed the 36,000,000 mark". Artwork by Don Roberts. Design and Layout by David Roberts (no kin). Modifications to ninety-two pages in the "stop press" section on pages 340 to 342. We have a copy "from the library of C. N. Thomas" which is signed by Norris McWhirter.